The Clinton Presbyterian Community is thoughtfully designed for all care levels. Whether you’re seeking independent living, assisted living, memory care, rehabilitation, or skilled nursing, you’ll find the right spaces and care to help you live fully and with purpose in our Clinton, SC, senior living community. You or your loved one will live among neighbors with similar needs and abilities so that their immediate surroundings, care professionals, and even activities can be easily tailored to meet specific needs. Our independent and assisted living communities can accommodate a variety of needs, ranging from apartments for seniors to round-the-clock care. Located off of the main building, these communities are centrally located in the heart of our community to offer easy access to all amenities and features. Our skilled nursing and rehabilitation communities offer short-term and long-term care for those needing comprehensive nursing care. 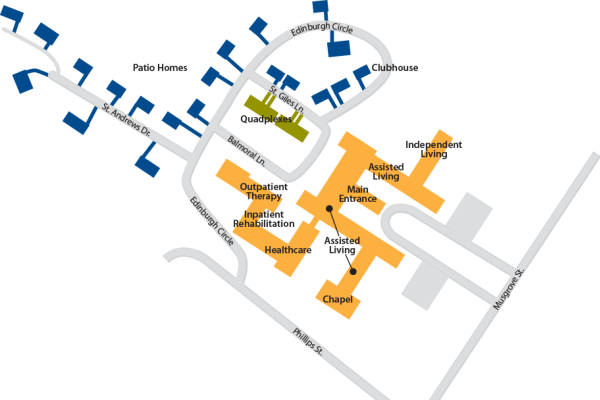 Residents of these spaces are welcome members of the community who enjoy chapel services, dining, and care just like our residents who call PCSC home all year long. Want to view our campus in person? Call today and we’ll be happy to provide a tour for you and your loved ones. Map intended only as a general reference. Amenities, location, and layout may be different than shown.